There has been no shortage since November of news reports and analyses about the food inflation. The 19% annual rise in fact masks widespread individual urban centres’ price shocks and individual food item trends. I have tried to unpack the year-on-year ‘national’ food inflation number using data from the Ministry Of Consumer Affairs, Food and Public Distribution – Department Of Consumer Affairs (Price Monitoring Cell). My guess is that this data is an under-estimate but is useful for spotting trends. 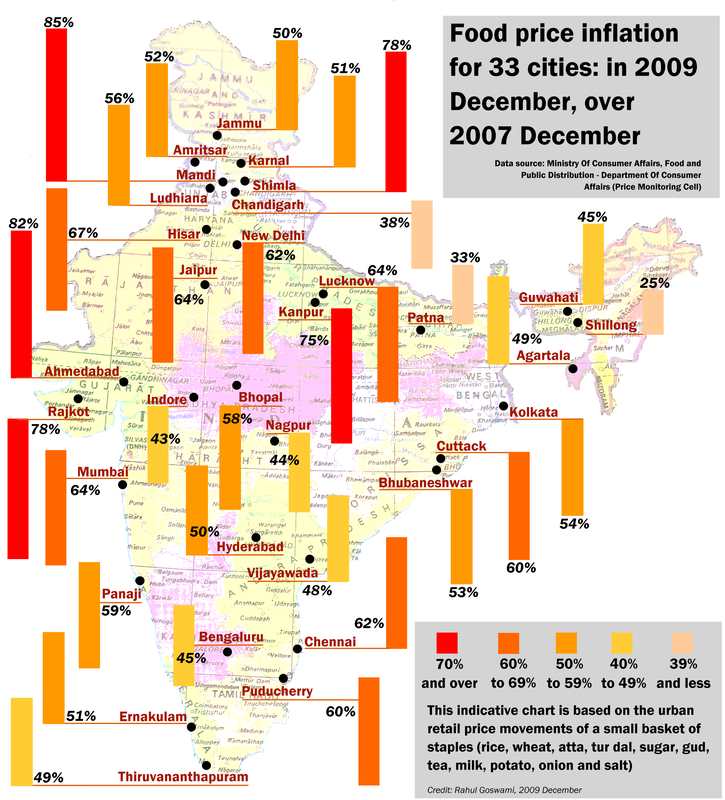 I collected prices for the 36 cities tracked by the PM Cell, monthly from 2007 December. Based on a small basket of staples (rice, wheat, atta, tur dal, sugar, gud, tea, milk, potato, onion, salt) a crude index shows that in 33 out of 36 cities, the 24 month (07 Dec to 09 Dec) rise in prices of items in this basket is more than 24%, and that in 23 cities it is more than 50%. Of the non-food expenditure 10 paise was spent on fuel for cooking and lighting. Based on what I have seen and heard on the field in Karnataka, Goa and western Maharashtra (and learnt about Gujarat and eastern UP from others) the available food basket seems to be shrinking (the so-called ‘coarse’ cereal group is conspicuously less), and where families have young and teenaged children there is pressure to buy processed and packaged snack foods (which is really a blight in our small rural markets). There are all sorts of oddities about the form that food takes in these markets – the price of a 50 gram pack of biscuits for example (Parle Glucose is the standard) has hardly moved in the last 3-4 years yet at the same point-of-purchase end, look at the way the prices of ground wheat have moved. Then there’s fuel and transport to account for, more about which you’ll find here. This question needs much more work in 2010 to strengthen some of the reliable data we have with updates, and to try to build in what we see and hear and sense from conversations with those who live and work in all those tahsils and talukas and blocks and mandals. I feel very strongly that we are lacking in our data the presence and impact of the many linkages that connect and influence the rural farming/labour household. Many of the measures we have have served us well but I think need to be supplemented – how to integrate the lessons and findings from the comprehensive National Family Health Survey, the Sarva Shiksha Abhiyan, the many studies into the income-providing measures of NREGA. Even though we worry about what the rural/urban poor household must spend on, the attraction to buy mobile phones amazes me. I have met young men who earn around Rs 4,000 a month but who have bought Samsung mobile phones costing Rs 5,000! Imagine spending more than a month’s income on a phone, I asked them, but they saw nothing worrying about their expenditure. Retailers who sell mobile phones used to keep the low cost and hardy Nokia phones which 3 years ago cost around Rs 1,700-1,800 (mine is still working), but not any longer, or they work at discouraging those who ask for the relatively cheaper phones. Much more than the hundred-dollar laptop we need the thousand-rupee mobile phone. The image is of a chart I made for the project group I work with (part of the National Agricultural Innovation Project, it’s called Agropedia and you can read more about it here). This chart helps point to some patterns (you can download the hi-res image here). I’m curious for example about Gujarat, whose grain and commodity traders have a long and murky history of hoarding. The North-Eastern cities could be insulated to some extent from the regional transport subsidy (road and rail). Cities in the Deccan are relatively better off than North Indian cities. The big difference between Chandigarh and Mandi is puzzling. “First, annual price fluctuations were extremely high. Second, differences in price levels between markets were very pronounced and persisted until well into the nineteenth century. Third, apart from neighbouring villages or cities, price series from different markets did not show comovements at all.” Studer looked at century-old data, but we still have 36 cities to tell us about staple food retail prices! Also, the three characteristics he mentions can be seen today too.